JLPT2017: Online registration will close at 9:00 p.m. Eastern time on Friday, September 29. Online registration will close at 9:00 p.m. Eastern time on Friday, September 29. The Japanese-Language Proficiency Test (JLPT) was developed in Japan, and has been offered since 1984 in countries all around the world as a means of evaluating the proficiency of non-native learners of Japanese. In the beginning, there were approximately 7,000 examinees worldwide. By 2011, there were more than 600,000 examinees in more than 60 countries. In the United States, more than 5,500 people took the JLPT in 2016. In 2017, the test will be administered at 17 test sites located around the country. The test is administered just once a year in the US, on the first Sunday of December. Posted in Uncategorized	| Comments Off on JLPT2017: Online registration will close at 9:00 p.m. Eastern time on Friday, September 29. Posted on September 20, 2017 by Admin. 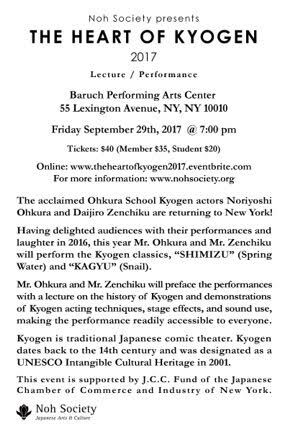 The acclaimed Ohkura School Kyogen actors Noriyoshi Ohkura and Daijiro Zenchiku are returning to New York! ( Spring Water) and “KAGYU”( Snail). Mr. Ohkura and Mr. Zenchiku will preface the performances with a lecture on the history of Kyogen and demonstrations of Kyogen acting techniques, stage effects, and sound use, making the performance readily accessible to everyone. The program will be presented in Japanese with English supertitles. Kyogen is traditional Japanese comic theater. Kyogen dates back to the 14th century and was designated a UNESCO Intangible Cultural Heritage in 2001. We are looking for students who are interested in doing an unpaid international internship related to teaching. Specifically, we are looking for interns to help undergraduate English majors in Japan improve their English. Interns will work with students in and outside of the classroom to help them academically and provide opportunities to practice English communication. Interns will also plan and create opportunities for students to use their English in nonacademic settings such as playing games, sports and other extracurricular activities. Those interested in our program can visit http://www.gendaieigo.info/internship for more information including testimonials from past participants. Please note that the position is ongoing. We welcome all students at American, Australian, Canadian, Irish, New Zealand and United Kingdom colleges and universities irrespective of religious faith, culture and nationality. While applications are welcome at all times, we are especially interested in applicants who would like to intern during our spring semester, between the months of April and July, and our fall semester, which starts in late September and runs until the end of January. Interns are also welcome for a full academic year. Dates for internships are flexible and can be arranged depending on individual schedules. We would appreciate it if you could inform any students who might be interested. If there is a specific person I should contact to have this emailed to interested students at your school, please contact me directly to avoid overloading anyone with multiple email messages. Thank you for your understanding and help. If there is any more information that I can provide for you, please feel free to contact me at anytime. Lastly, I am attaching a flyer on our program. If it is possible to post or distribute the attachment to students who may be interested, we would appreciate it. We look forward to hearing from you and your students. Posted on September 14, 2017 by Admin. 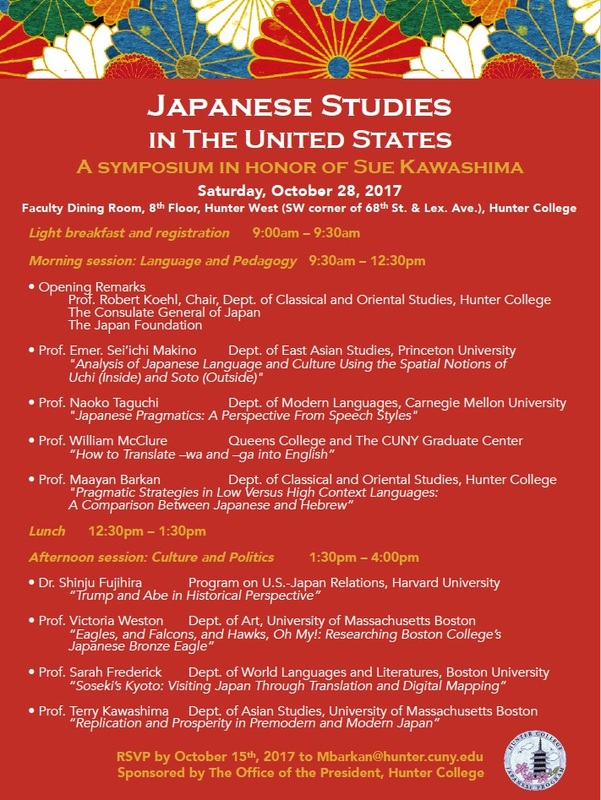 Hunter College’s Japanese Program would like to invite you to a symposium in honor of Sue Kawashima, who has been teaching at Hunter for 30 years now. As you can see in the poster, we are going to have a whole day symposium with speakers such as Seiichi Makino and Bill McClure. You are all welcome to participate. 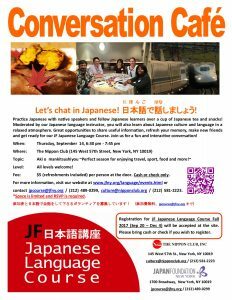 We are hoping for an audience of Japanese language and culture educators, and other people who are very interested in the Japanese language language and culture. Please feel free to send this to anyone who might be interested. Posted on September 13, 2017 by Admin. The Fair will be held on Thursday, September 14, 2017 from 12:30 to 2:30 p.m. in the B2-level auxiliary gym (entrance on East 24th street). Someone from the Study Abroad Office will be bringing flyers for the fairby departmental offices, and we would be very grateful if one or more of them could be posted. We would like to warmly invite you and the other members of the department to come to the fair, and would be grateful if you would encourage your students, and your colleagues’ students, to do the same. Many students who were interested in studying abroad attended the Study Abroad Fair last spring. These fairs offer a wonderful opportunity for program providers to speak to Baruch students about thestudy abroad programs available to our students. This year, exchange students from our partner universities who are studying at Baruch this term, and Baruch students who have studied at those universities, will be staffing tables to give Baruch students even more information about campus lifeabroad. The Study Abroad Fair also gives Baruch faculty members the chance to learn more about the programs our students can attend. Understanding the kinds of academic and cultural experiences our students have abroad will help you gain a better sense of how study abroad might be more thoroughly integrated into a student’s overall college career. If you have any questions regarding the details of the fair, please contact me by phone at (646) 312-2091, or via email at dina.luuvanlang@baruch.cuny.edu. Students with some degree of both Japanese and English language abilities are invited to come speak and interview with hiring companies for full-time and internship positions at the following Career Forums. Positions are located worldwide. We encourage you to explore future options and make connections even if you have a few years left before graduation. Be proactive! If you have questions about any of the Career Forums, please contact me at k.soejima@discointer.com.